Left to right, Colonel James Stone, Charlie Mooneyham, Jerry Smithson, Charles Arthur Smithson, Brit Knox and Dan Bowling. 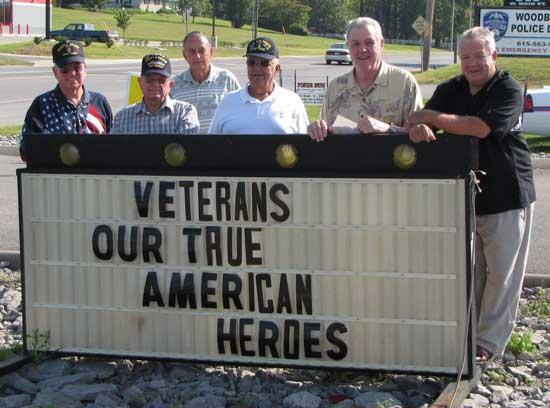 The Veterans and Concerned Citizens for the Veterans of Cannon County are making plans for the Veterans Day Activities for 2009 at the Cannon County High School on Friday, November 13 and the Veterans Day Parade on Saturday, November 14. This is our sixteenth year honoring our veterans. Our goal is to make our program and parade a little bigger and better each year. For 2009 we are asking our sponsors from 2008 and past to continue their outstanding support. We are also seeking new sponsors for 2009 and beyond. We have a new poster this year (see picture) which can be displayed in a prominent location to show your support to the veterans of Cannon County. All sponsors are listed in our program booklet given to the entire faculty, teachers, students, veterans and guests at Cannon County High School. To help kick off our fund drive for 2009, Dan Bowling, owner of the First Stop Market in Woodbury donated $500 to the fund, Bowling a Vietnam Veteran is completely behind the Veterans in Cannon County. He is using his store to try and collect the names of the veterans of the county; there is a list on his counter that all veterans can sign when they come into the store. One reason for the list, he tells the Cannon Courier, is he wants to find out how many WWII vets are still with us in the county. When Dan finds that out he will be getting together with others to send these veterans to Washington D.C. to the WWI and WWII Memorial free of charge to the vets. "I believe that we owe it to those vets to let them see the memorial before they die" said Mr. Bowling, who also stated that there are not too many of the soldiers of the World War II era that are still living. The President and Founding Father of the Veterans and Concerned Citizens for the Veterans of Cannon County Thomas Nichols was represented by veteran Brit Knox when he accepted the check from First Stops' Dan Bowling. Those gathering together at the First Stop Market were Colonel Jim Stone, Luther Mooneyham, Charles Arthur Smithson and his brother Jerry Smithson. Our organization is non profit; all funds go towards our Veterans Program, Parade and other activities throughout the year. The Veterans Service Officer for Cannon County is retired Sgt. Penny Daniels and she can be seen at the Old Good Samaritan Hospital in Woodbury. Our members will be distributing the new poster for 2009. You can also contact one of the following members and they will make sure that they get your poster to you so you can show your support for the Veterans of this County. Tom Nichols, Jim Stone, Penny Daniels, Dr. Bill Jennings, Luther Mooneyham, Clark Rains, Doug Huddleston, Charles Arthur Smithson and Bob Stoetzel. "Please support the Veterans of Cannon County. These men and women who served and serve this great country make sacrifices so we can enjoy this wonderful place and freedom we enjoy today. Thank you and God Bless you, and God Bless our Veterans and our great Country." Colonel Jim Stone. *Statistics taken from an article written in the Memphis Commercial Appeal, August 16, 2009 by Kevin McKensie.